James Woods, a Democratic candidate for Arizona's 5th congressional district, is running as an atheist. If elected, he would be the only self-identified atheist in congress. I have no problem with people who believe, I have no problem with lawmakers who believe, as long as they write laws in keeping with secular positions, as long as you have a rational position that can be justified through secular beliefs, I have no problem with that. Like, a religious person might say, 'Well, my religion teaches that we should feed and clothe the poor, so we need to have social safety net programs.' Well, I'm all for that, I agree with that. Well, you can also make a rationalist, secular argument. 'Well, helping the poor helps all of us, because… and it's the right thing to do.' I don't see a distinction as to where your ideals come from. There has only been one self-identified representative in the history of the U.S. House so far. Former Rep. Pete Stark, a Democrat from Northern California first elected in 1972, announced he was a non-theist in 2007. After 20 terms in congress, Stark lost his seat in 2012. His loss wasn't related to his atheism, but a change in the California primary system. Hillary Clinton is talking about her faith. It is an all-but foregone conclusion that the former secretary of state, former New York senator, and former first lady is running for president in 2016. It's all-but decided that she'll be the Democratic Party's nominee. And the probable candidate, in probable preparation for her campaign, is talking about religion in a personal way. At a gathering of about 7,000 United Methodist women on Saturday, Clinton recalled the Methodist church of her childhood. "I love that church," she said, according to the Associated Press. "I love the doors that it opened in my understanding of the world; I loved the way it helped to deepen my faith and ground it." Clinton speaks of her faith, first, biographically. This can be politically awkward because she speaks of it in the past tense, as a memory and a part of her coming of age. It can seem that Clinton has no current faith except politics. She can be understood as implying that religion isn't relevant to her life today, while actually specifically saying that religion was relevant how she became who she became. Yet in this mode, Clinton's religion talk is important, a biographical key, a critical part of the narrative of her identity. She talks about her personal faith to explain how she became a liberal. "And now I eat your eyeballs." "I will scoop them out with the spoon." Only a very small number of religious congregations file for bankruptcy. In any given year, about 1 percent of American houses of worship close their doors, according to a study in the Missouri Law Review. But only about .00026 percent file legal paperwork seeking protection from debtors. Churches close, but they don't generally go bankrupt. Even in America, where there are lots of small religious groups and lots of religious debt, bankruptcy is rare. It doesn't happen, except when it does. Which is not to say it happens for no reason. Pamela Foohey, of the University of Illinois College of Law, looked at more than 450 congregations filing for bankruptcy over a six-year period. Her study shows that the Protestant churches going bankrupt almost always cited external circumstances, out of the control of the religious leadership. The effect the financial crisis had on giving was referenced a lot in court documents. 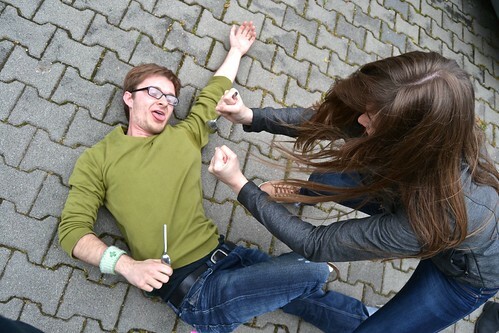 Natural disasters, such as Hurricane Sandy, were said to precipitate the financial problems. Yet, while storms both natural and economic surely took their toll, they don't actually explain the religious bankruptcies. The 2008 financial crisis touched everyone, but not everyone went bankrupt. A common factor among these religious groups, Foohey found, was their ecclesial organization. That is to say, they tended to be churches built around the charisma of one person. 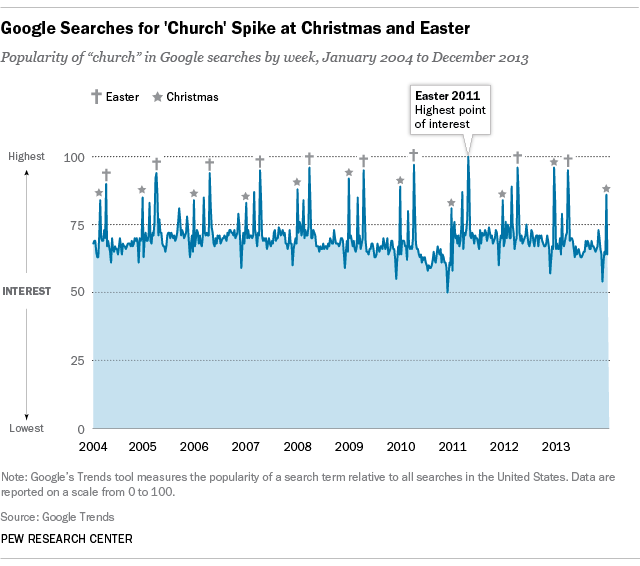 More Americans search for 'church' around Easter than at any other time, with the Christmas season usually ranking second, according to Google Trends data between 2004 and 2013 . . . Easter is Christianity's oldest and most important holiday, during which Christians celebrate Jesus' Resurrection three days after he was crucified. In liturgical terms, Easter Sunday is a moveable feast. Its observance, which comes at the end of a 40-day period of penance, fasting and self-examination called Lent, changes within a range of time each spring. Yvon Prehn, founder and director of Effective Church Communications, told The Christian Post last year that churches often don't see any growth after big Easter services, even when they put a lot of effort into outreach. Some churches have a petting zoo or they have pre-lattes or they have a brunch, they do all this special stuff. Well, they don't do that every week. People bring a lot of friends and kind of the unspoken assumption is that if they like the church and they think we're cool and we really impress them and they love the worship music, they'll just come back next week to Sunday school and bring their kids . . . I strongly recommend something that says 'Here's what we do when it isn't Easter. We've got this for your kids, we've got a single's ministry here, we've got this stuff for women and here's our regular celebration services.' You know, something just really simple and upbeat that says 'When it isn't Easter, this is what we're doing.'" "There's a lot of terror involved in this idea, and this is why I think it arouses so much controversy. And I'm not sure we face the terror that is within us, of saying 'God is dead.'" "It was a terrible day. And Christ was tried, and then he was scourged, and then he was taken to the cross by the Romans." -- Jeffrey Bauer, United Church of Christ pastor in Bethlehem, Penn. 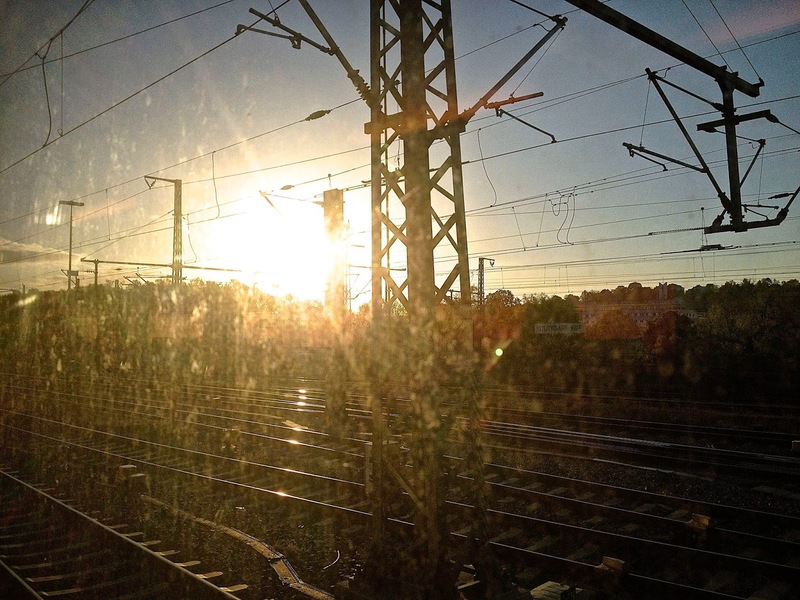 A new semester, another sunrise on the Deutschebahn. It makes me think of the joke about reality having a well-known liberal bias: one could also say that reality has a well-known theological bias. I think it's observably the case that our understanding of the world is just not exhausted by talking about our daylight enlightened systems, our best intentions, our codes of law and science, the things that in the bright light of noon we want to be true about ourselves. There's all the other stuff, too, and anyone who is paying attention keeps tripping over it. You get back onto theological ground no matter what your opinions are. The prime example of problematic religious arguments in the pluralist public square: the appeal to authority. If religious rhetoric or religious arguments are in some way to be disallowed from public debates about public things, this is the most common explanation for why. Public discourse has to be secular. It has to be secular in the sense that it's open to everyone. The arguments ought to be universally available, regardless of faith commitment, worldview, metaphysical picture of ultimate reality, etc. Jürgen Habermas says it has to be secular in the sense of being "post-metaphysical." This isn't supposed to mean that people with metaphysics are barred from the discourse (though sometimes it does mean that people with a minority metaphysics are excluded). It is supposed to mean, rather, that there are certain rules to public discourse. For example, that positions are not to be justified by reference to an ultimate reality not available to all. Arguments are not counted as rational if they make use of special or secret knowledge. Appeals to a transcendent good have to be bracketted; only appeals to an immanent good are allowed. Put another way: the argument "for the Bible tells me so" is not allowed; all arguments must be arguments based on measurable human flourishing. 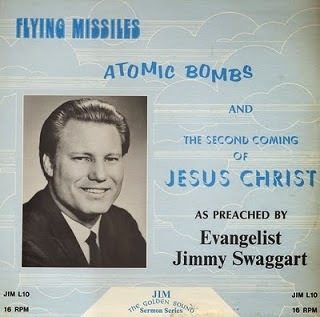 "I'm here to tell you tonight," Jimmy Swaggart says, in this classic bit of Pentecostal preaching, recorded for the radio, "that we've coming down to the end of time." This is apparently a pretty rare recording. Mark Betcher notes: "this recording was recorded at 16 RPM. 16 RPM was used for radio transcription discs. But 16 RPM commercial records were never widely available, although it was common to see new turntable models with a 16 RPM speed setting produced as late as the 1970s." One hundred years ago today, April 2, 1914, white Pentecostal preachers and revivalists from across America gathered in a Hot Springs, Arkansas winter resort, and founded the Assemblies of God. The call that gathered them there was issued to all who "desire with united purpose to co-operate in love and peace to push the interests of the kingdom of God everywhere," with the caveat that that meant it was "only for saints who believe in the baptism with the Holy Ghost with sings (sic) following, Acts 2:4; 10:46; 19:6; Mark 16:6-18; 1 Cor. 12:8:11." It's a fascinating document. It says a lot about who these people were and the world they lived in. One cannot accept a gift without a certain level of vulnerability. This is the risk of gifts. Gifts are dangerous, because accepting a gift means accepting an unknown. There are no guarantees. Gifts cannot be prescribed. It's even possible that, accepting that unknown, you might find that you are changed, and to be open to a gift means to be open to being changed. In this sense, a gift a can be a useful analogy for the open-endedness of thinking. Thinking, at least how Peter C. Blum thinks about thinking in his new book, is unsafe. It does not come with guarantees, and is risky exactly in the way in which it calls for one to open up to possibilities that cannot be safely foreclosed in advance. Blum engages Christian theology and continental or "postmodern" philosophy in For a Church to Come, combining them in ways that reveal this risk. 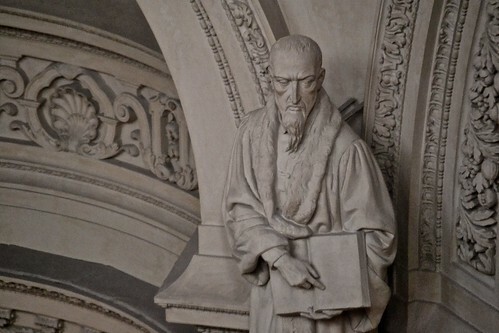 He wants to recover, or perhaps uncover, a certain unsettledness, which seems to him important for Jesus' gospel and a valuable thing to take from the 20th century philosophers who set for themselves the task of "unrelenting suspicion of finality and closure" (21). In this book, Blum engages in what he calls experiments. He explains, "I mean experiment in Nietzsche's sense of the term, a deliberately unsettling sort of experiencing, a risking of our perspective that may lead to change that we do not foresee" (22). The true risk of such thinking, for Blum, is not that it might leave one, finally, in the "wrong" position. The fear, rather, is that there will be no finality, no point after which thinking is safely beyond risk. The challenge of For a Church to Come, at the broadest level, is to become comfortable with the ongoing discomfort of being challenged. Thinking is presented as always provisional, always open to further thinking, open to that which is "to come," even or especially when what's coming is a change for the one who is is waiting. The real work of thinking, as presented here, is also the work of faith. Which is to say, it is replacing the fixedness of idols with an openness to that which is inconceivably transcendent, and problematically so (100). "I do explicitly intend," Blum writes, "to 'make things difficult'" (47). This "making difficult" is itself a gift.